Just returned from a trip to China with Reid, Michelle, Ellen and Kazuya organized by Leonard Liu and his team. We met with VCs, entrepreneurs and a few of my old friends. 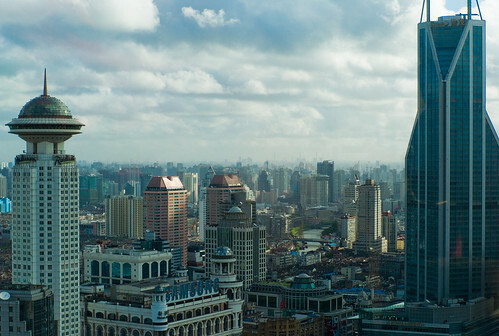 I was in Shanghai a few years ago just as the US VCs were starting to set up offices in Shanghai. Things have clearly moved forward a notch. The first wave of entrepreneurs have exited their successful ventures and are now on their second or third venture. The VCs seem to have a community. More and more US educated Chinese seem to be returning. There are many things about the Chinese venture scene that remind me of the Japanese venture scene. There are clearly fewer experienced VCs and entrepreneurs compared to Silicon Valley. Many of the people are copying US models - some with a great deal of success. The Chinese market in general reminds me of Japan during the bubble. Everyone hugely optimistic, explosion of spending, explosion of brands and luxury goods, investors from all over the place flocking to participate. While the dynamics are quite different and the market much larger in many ways, I see some of the similar indicators of irrational exuberance as well. When we launched a lot of our ventures in Japan like Internet advertising, ecommerce and other things that were going strong in the US, we typically overestimated the short term growth for Japan. I have to give Reid credit for triggering this thought, but I now think that it is possible that many entrepreneurs may be overestimating how easy it is going to be to get Internet ads and ecommerce going in China. On the other hand, even very narrow nitchy markets in China are HUGE so it's possible to build pretty big business with a narrow focus compared to what you can do in the US or Japan. I'm still not sure what we're going to end up doing in China if anything, but I'll keep you posted. Thanks for everyone who took time in their busy schedules to meet with us and share thoughts. Thanks especially to Leonard, John, Vivian and Stefanie for organizing such a great trip! I organized my photos into the Shanghai part and the Beijing part. I love the photo... it looks like one of the establishing shots in the Star Wars prequels or something, it's so sci-fi looking. Yeah, I'm half expecting space ships floating in the sky. Oddly futuristic. How was the smog? I heard the quality of air in the big Chinese cities is very poor. The smog wasn't bad when we were there. Wow..... I have to go now. It looks like something out of SciFi.... like out of Star Wars. There are several differences between China now and Japan during the bubble. First of all, Chinese labor costs are far cheaper. This means the amount of money needed to start a company is much less. Second, China has a lot of undeveloped potential. Third, open-source software lowers the barrier of entry even more. Fourth, the market is a big, relatively unregulated mess where anything goes. It is chaotic, which accounts in large part for its growth. What a pic. Reeks of general prosperity. You get the same feeling in Dubai. And in small pockets of Bangalore. Joi Ito - "China trip" by Joi Ito is licensed under a Creative Commons Attribution 4.0 International License.